A couple of months back I got my hands on a balisong from Oregon’s knife powerhouse Benchmade. Balisongs, or butterfly knives, have been around a long time, and there is much debate about their exact origin and purpose. What everyone agrees on is that balisongs are a heck of a lot of fun to use, and they are still increasingly popular despite the many legal issues. The model I’m examining today is the well-respected Benchmade 51 Morpho. There are a growing number of butterfly knives to choose from today which can overwhelm the newbies. As usual there’s a lot of crap on the market so you need to make sure you pick the right one. First and foremost a good balisong needs to be safe, but also combining the right weight and strength to be used effectively. Benchmade keeps the Balisong fanbase happy with the impressive 51 Morpho. Benchmade has been producing balisongs since the beginnings of the company, so they’ve had a long time to refine their production over the years. 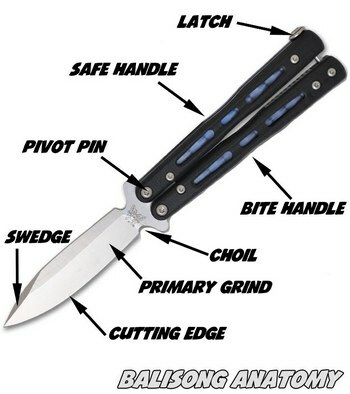 In fact, Benchmade started out back in ’79 known as Bali-Song and even registered that term as a trademark to the later annoyance of butterfly knife fans worldwide. 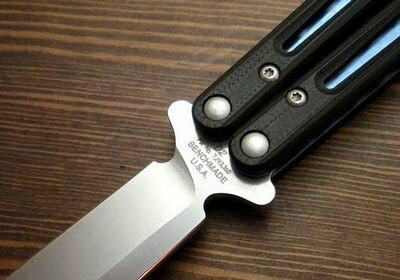 The Benchmade 51 was first introduced in 2009 as the successor to the popular Benchmade 42 which was considered by many to be the standard-setter in the balisong flipping community. To the surprise of many the BM 51 was marketed as an EDC which is unusual in the balisong marketplace. In today’s society it can be difficult to use your balisong as an EDC but I know many who do. In the 51 Morpho, Benchmade offers the option of black or blue G-10 handles and black or satin coated D2 blades for a little more personalization. Deployment of the blade can be accomplished in many ways which sets it apart from many other types of knives. The knife can be whirled around wildly in a series of deft maneuvers, or it can be simply opened directly in a swift action. As a result of this, some states restrict the use of balisongs, so before you buy one and tote it around be sure to check your state laws. The precision with which a balisong can be opened depends partially upon the user, and partially upon the specifications of the knife itself. So let’s get into the details of this butterfly knife. The 51 Morpho measures 5.4” closed, opens to 9.4”and the handle thickness is 0.48”. This slim handle combined with the length spreads the knife out deep within your pocket. This keeps things incognito, and makes it easy to reach past the knife to grab anything else within your pocket. At four and a quarter inches, the blade is relatively lengthy but not out of the ordinary for a balisong. Benchmade used titanium liners (in a striking blue color) to reduce the weight without compromising strength. This adds to the price tag, but helps to put the weight at a very manageable 3.3 ounces. This is definitely light for a balisong and as you’ll discover, one of the stand-out features of the 51. The fact that a balisong has two skeletonized handles can make them unpleasant to hold, but I found the 51’s ergonomics very comfortable and it fit within my handle nicely. The G-10 is nicely textured, enough to prevent the knife slipping out of your hands, but not too abrasive that it becomes a pain to use. The pocket clip is very low profile, sturdy and does not adversely affect the use of the knife. My hands are a bit on the smaller side, but I think users with medium to medium-large hands will find it just as comfortable. The blade of the Benchmade 51 is a crowned modified spear point, made from D2 tool steel. No surprise it comes razor sharp out of the box and really well manufactured. It really is silky smooth. As I discuss on my blade steel page, D2 is a hard steel that will take and hold a sharp edge for quite some time. On the flip side, the hardness of the steel can make it a serious chore to re-sharpen. Also important to remember, D2 tool steel is not particularly rust resistant, be sure to adequately protect or clean the blade it if you plan on using it in a humid or moist environment. A common problem among balisongs is the strength of the tip. Many times, blade tips will have to be re-profiled to provide adequate strength. Benchmade’s choice of blade type has made this almost a non-issue with the 51. Many a times I have inadvertently whacked the blade into furniture (the wife hates me) but the tip has always emerged unscathed. The opening mechanism of the balisong is indeed unique. There are two handles attached to blade via pivots, which can be held in open or closed position by a latch. If the latch is disengaged, the handles are allowed to swing freely. Wrist movement and adjusting the position of the handles in the user’s hand determine the movement of the balisong. The 51 flips with ease, I had no problem opening and closing it. For most balisongs, the handles are held in place by a T-latch which has to be manually moved by the user. Benchmade, however, has a patent for its spring latch which is much easier to operate. To disengage the latch from the closed position, one simply has to squeeze the handles and the latch springs open with a satisfying click, and the knife is ready to open. It does take a fair bit of force to activate the spring latch, and I have never had it open accidentally. When the latch is locked in place when the knife is open, the user has to manually disengage it by squeezing the handles and moving the latch with a finger. It isn’t necessarily convenient, but it does help ensure the latch doesn’t unintentionally open while the knife is being used. Kudos to Benchmade for their innovation. We’ve come to expect near perfect fit and finish from Benchmade, and they didn’t disappoint on the 51 Morpho. With many balisongs it can be especially hard to get the tolerances right. Too tight and the knife won’t flip smoothly, too loose and the blade will hit the handles and dull itself. When I picked mine up out of the box for the first time, I was amazed at how smooth it was. No matter what you do with the knife, it obeys quickly without question and it does not slow down for anything. There are downsides to this, but I’ll discuss that later. For the EDC use Benchmade intended, the ease of use is a fantastic factor to consider. Overall the 51 Morpho looks stunning all round. While it is perfect out of the box, unfortunately I have to report it may not stay that way forever. After owning it for about a month or so, I noticed a pivot screw had become loose and I was very concerned to say least. In fact, the constant stress from flipping the knife had loosened both pivot screws, and that fantastic out of the box tolerance had not lasted for long. I used a thread locker (try Loctite) to secure both hex screws back in their proper places, and I suggest any Benchmade 51 owner to do the same once every other month. While this problem can be remedied fairly easily, it is certainly something to watch out for. Other than my experience with the pivot screws I found the finish to be top notch. The blue anodized titanium liners are absolutely stunning, and I couldn’t find any serious flaws. The G-10 looks great and extremely clean cut. Through my experiences, only serious abrasion will affect the knife’s appearance. Rest assured the 51 will keep its good looks for a long time. An important aspect of this knife is as its use a flipper. 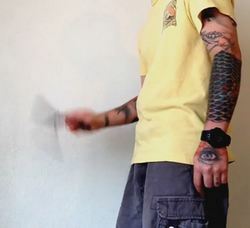 Balisong manipulation is an art, and there are many different styles and techniques of flipping. The weight and balance of the balisong will have a major affect on how well one can flip. I’m not an expert flipper myself so I also brought in my balisong buddy Tim to put the 51 through its paces. This is one category where I have to say the Benchmade 51 is somewhat lacking. While speed and ease of use are great for EDC purposes, it negatively affects its ability to be used for advanced maneuvers. It is far too easy to lose control of such a light knife, and it carries almost no momentum making many rolling flips tricky. Certainly not a competition flipper as it demands perfection to execute many tricks. Flipping with speed can be fun, but for some moves control is more important. To be fair, it is a decent weight for an introductory knife and very easy to learn on. However, for anyone aspiring to become great at flipping, you may want to try the heavier BM 62. Overall, the Benchmade 51 Morpho is a very impressive butterfly knife but not without a few minor flaws. The handles are very robust and the D2 blade is one of the best I’ve seen. The 51 has great fit and finish, and a perfect size and weight for EDC use. The lightness of the 51 is an advantage here as you can flip it open super quick and close it likewise. Unfortunately the 51’s weight is a double-edge sword (no pun intended) as it hinders its use as an advanced flipper which may not satisfy some balisong enthusiasts. Finally, balisongs are notorious for their expensive production costs, and Benchmade knives are usually expensive in any case. This double whammy puts the 51 at a price point of a whopping $240 or so. Still, it’s cheaper than some of the offerings from competitors like Microtech. Worth it? Well, I agree it’s a tad on the pricey side but yes I think it’s worth it overall. Sure you can buy ten or more cheap Chinese balisong’s for that price but if you want quality the Benchmade is the way to go. Is it the best balisong knife? Well, perhaps not but probably the best you can get under $250 right now. Two final words of warning – (i) watch out for fakes and (ii) respect your state laws.